After introducing rice cereal as baby's first food, we could start widening baby's palette by introducing fruits and vegetables. I introduced a couple of vegetables first before introducing fruits. What goes first is a matter of personal preference. The first vegetable I introduced was sweet potatoes. Sweet potatoes are considered as powerhouse of energy and this provides the energy your baby needs as (s)he begins to crawl. Using a vegetable peeler, peel the sweet potato. Chop the potato into 1 inch cubes. Steam these on stove top, in a pan, covered with fresh water. Remove from fire when the pieces are fork-tender. 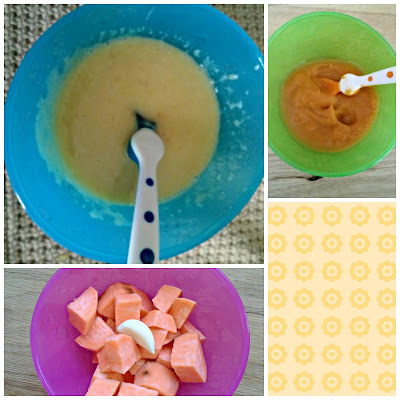 Let cool and puree in a blender or baby food mill. Add the cooking water or formula or cereal to thin out or thicken the puree. Same as above, but with red potatoes. Add a little formula to make it creamy. 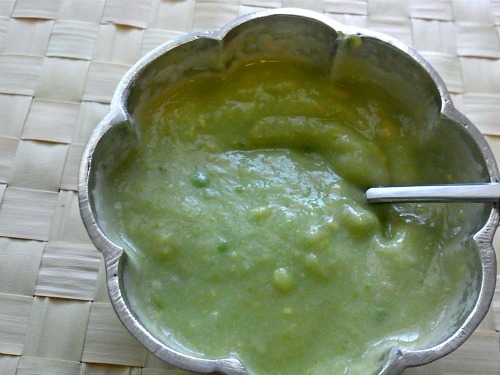 Avocado is the only vegetable that can be fed uncooked to babies at this age. Cut the avocado and scoop out the ripe flesh. Blend this into a whipped cream consistency. Feed immediately to avoid discoloration. Due to nitrate concerns, it is safer to discard the water that spinach was cooked in. Or, just use that water in your food. Steam 1 cup of spinach and 1 garlic clove in water. When cool, discard the water and blend to a smooth paste. Add formula, if desired, for creamy taste. Steam 3 big florets of cauliflower, with 1 garlic clove. Using the steaming water, blend the vegetables to a creamy paste. 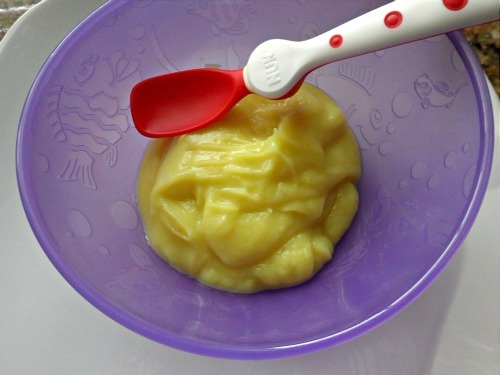 If your baby is ready for texture, you could use a potato ricer to mash the cauliflower. When to start solids and what to feed a baby are very important matters that you need to discuss with your child's pediatrician. Also, if you choose to make first foods at home, first follow what your family's tradition is. This is just an attempt to document what is commonly followed in my community. I am not a pediatrician :) . Please use extreme caution in matters of your baby's health.